Seneca, SC — The war on nature continues to claim the lives of innocent young people. In Seneca, South Carolina a teenager lost his life Sunday night for the heinous act of driving a woman to sell a bag of marijuana. It happened in a similar fashion to the shooting of Samuel Dubose by Officer Ray Tensing, who was just charged with murder. Zachary Hammond, 19, was shot to death through an open side window by a police officer assisting in the sting operation. While real crimes were happening elsewhere, this cop and an undercover agent were setting people up for selling a plant that actually happens to be legal in many other states. “According to the account of the incident given to media by Police Chief John Covington, the officer “fired two shots in self-defense” as Zachary “drove his vehicle directly at the officer” in the back parking lot of Hardee’s restaurant on U.S. 123. 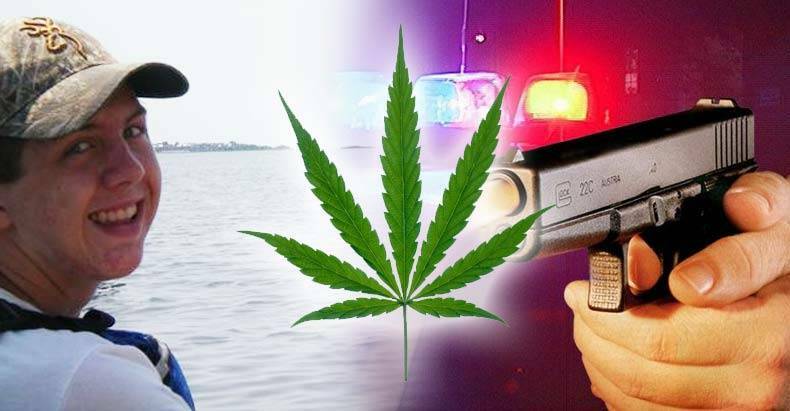 Instead of getting out of the way, the officer felt that it was more important to shoot the driver to death than let that dangerous bag of marijuana threaten the public. Irony at its most tragic. If you are in front of a car, that is going to run you over, how do you manage to fire through a side window? The fact that Zachary was shot through the side window in the upper left torso and collarbone/shoulder area suggests that the car was, indeed, driving past the officer. Thus far, it is not known if the shooting was captured on video. Dashcam footage has been given to investigators and is being requested by the Post and Courier under the state’s open records act. It would not be surprising if video emerges that proves the police account to be false, just like in the case of Dubose and so many others. The officer is on administrative leave while the State Law Enforcement Division investigates the shooting, but it is unlikely that the government will find any wrongdoing unless incontrovertible video footage emerges. The Blue Shield is very good at denying culpability when police enact violence on citizens. The parents of the teenager have hired an attorney and are disputing the official story. It is much more likely that Zachary was simply scared and trying to flee the scene. “I don’t think you use excessive force for somebody in a Honda Civic that they thought he had pot,” said Paul Hammond, the grieving father. Zachary had recently graduated from Seneca High School in 2014. He loved history and was involved in wrestling and soccer. Now, because of a senseless war on weed and a trigger-happy cop, Zachary will never get to pursue those things. The incident also puts South Carolina on track to have the most officer-involved shootings in 15 years.